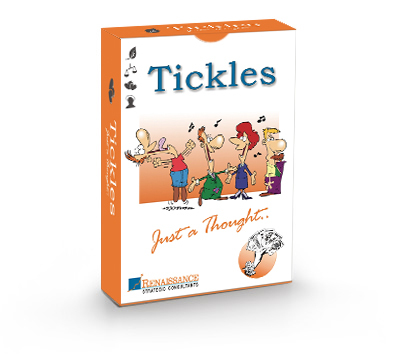 Tickles – a pack of 52 cards stimulates creative thinking and injects freshness in life. These cards give you simple and doable tips to achieve greater control of your life. Today, one of the most popular categories in any bookshop is the category of self-help. This should not come as a surprise to any of us. For in today’s competitive and commercial world, we are all constantly searching... Searching for more meaning, searching for that elusive balance between work and home, searching for the joy and spontaneity that we have all known as children. We turn to books in the hope that they will open new windows and let new light into our lives. And yet, too many complain that these books have an impact that is only fleeting. There is a rush of energy; a lot of new resolutions and things look much better for a while. However, the world is full of real and difficult pressures, and we quickly lapse back into a familiar drudgery, dismissing the book as a nice idea which could not stand the test of practice. As Shakespeare once said ‘The fault dear Brutus, lies not in our stars, but in ourselves, that we are underlings.’ The point is simple- by definition; Self-Help is not something you can get from a book. A book can give you ideas- Self help is about consistent action in pursuit of a goal and the action has to be taken by each and every one of us personally. Personal change is a consequence of learning through conscious action. Tickles is a self help tool which gives you stimulus for action. Our years of working in people development have helped us identify the following as broad areas in which all of us seek to improve the quality of our lives. Tickles cards are categorised in 4 broad areas in which all of us seek to improve the quality of our life. Our thoughts are the mirror of our actions. Our thoughts themselves are a function of our experiences and the way we process/ view our experience. If we travel to the same places, meet the same people, seek the same goals, follow the same routines, it is but apparent that we will think the same thoughts. Tickles freshness cards give you practical ways to continually inject freshness into your daily routines by deliberately seeking new experience. The experiences are simple day-to-day things that will allow you to rediscover yourself. We all seek more meaning and more achievement at work, and yet bemoan the quality and quantity of time we spend with our families. This has reached the point where we feel more like victims of time than masters of it. Tickles time cards give you simple , doable tips to enhance your understanding of time and create small but significant steps to achieving greater control of both your time and your life. A good part of our identity is derived from the way we relate to other people. The warmth and understanding we experience in our close relationships is the anchor on which we base many of our actions. Yet we rarely manage to express our emotions, or spend time giving unconditionally to those we care for, because we are too busy looking over our own shoulders. Tickles Relationships cards help you to take simple actions to understand the significant others in your life and see the world through their eyes. We can only improve that which we can understand. There are no ready-made mirrors to the human mind, and it is only through conscious experimentation and questioning that we can know ourselves. Tickles Self-awareness cards help you by suggesting simple experiments to help you understand yourself and your true potential. Tickles is your journey of self-discovery. To assist this journey, we have created learning pages-each Tickles card is visually coded. Choose a card at random till you get a card in the area of current interest. Read the card and ACT. Having acted, jot down your learnings and keep going... Alternatively, if you have a close group of friends, select the card together and then agree to review your experiences after a week. Discuss your experiences as a group and then jot down your learnings. This way you grow not only from your own experience, but also from those of your near and dear ones. “The secret of all creation is to arrive where you once began and to truly know the place for the first time”. © 2004 Renaissance. All rights reserved.